What better vehicle to go camping with other than the 2015 Jeep Wrangler? If you consider yourself an avid adventurer, camping with your Jeep Wrangler will allow you to see many sights that many other people cannot access. Built for adventure, Jeep Wranglers make camping easy, accessible, and fun. No matter the different types of terrain you plan on covering, your Jeep Wrangler will make this an experience you won’t forget. Quirk Works Parts can provide you with the accessories you will need for your camping trip, making it easier than ever to purchase one of our featured Mopar tents. Mopar tents makes for a comfortable shelter to be in when campgrounds are crowded. With factory warranties guaranteed, the outdoor camping tent is a Genuine OEM Mopar Part that can be easily purchased through our reliable parts department. With factory warranties guaranteed, the outdoor camping tent is a Genuine OEM Mopar Part that can be easily purchased through our reliable parts department. Another Quirk vehicle that is great in various camping terrains is the Dodge Ram. Some of the tent’s features include a full rain fly, overhead storage net, inside pockets and storage bag; and it all attaches right to the back of your truck. 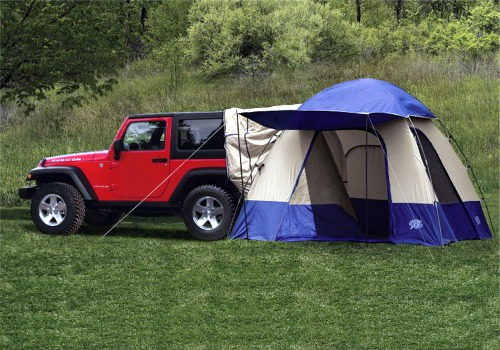 Mopar tents are easily adjustable to fit the custom size of your vehicle.